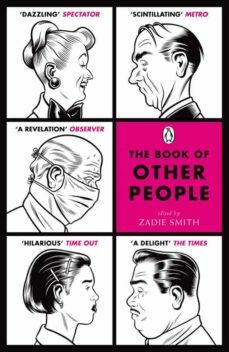 The Book of Other People is just that: a book of other people. Open its covers and you’ll make a whole host of new acquaintances. Nick Hornby and Posy Simmonds present the ever-diverging writing life of Jamie Johnson; Hari Kunzru twitches open his net curtains to reveal the irrepressible Magda Mandela (at 4:30a.m., in her lime-green thong); Jonathan Safran Foers Grandmother offers cookies to sweeten the tale of her heart scan; and Dave Eggers, George Saunders, David Mitchell, Colm Tóibín, A.M. Homes, Chris Ware and many more each have someone to introduce to you, too.With an introduction by Zadie Smith and brand-new stories from over twenty of the best writers of their generation from both sides of the Atlantic, The Book of Other People is as dazzling and inventive as its authors, and as vivid and wide-ranging as its characters.